It wasn’t so many years ago that I moved back to Northern California from the Deep South (well, Southern California anyway). With that brought new challenges as far as fishing in Saltwater. I discovered rockfish in 50 feet of water instead of 400ft, tuna out 60 miles instead of just inside Catalina Island, bad weather most of the time instead of good, and a salmon fishery I knew nothing about. 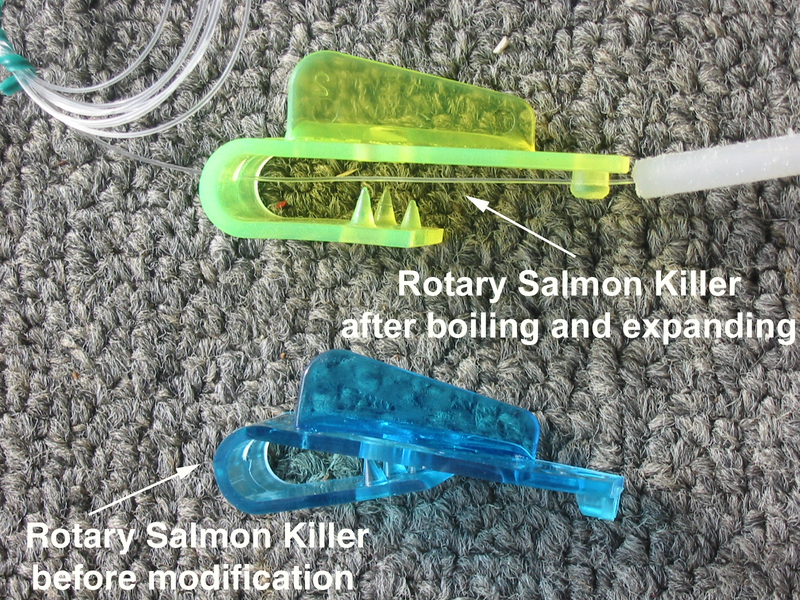 Most of the changes were pretty easy to adapt to except for the salmon part of it. Sure, you can read a book, get a video, and listen to salesman after salesman hawk their products too you touting that they have the best fish catching invention since the hook. All of this information was put to the test on the water, time and time again with varying degrees of success, some days good, most days adequate, and whole lot of days down right disappointing. As I got more and more familiar with the fishing scene in Northern California, there was one constant that seemed to resonate throughout the fishing community–the name Bob Franko. Bob was mostly being known for tuna and pioneering some of the most effective techniques for catching them in our waters and he was considered an icon. With the advent of Bob’s Coastside Fishing Club, I offered my help in web design. As I got to know him, Bob took me under his wing and not just told me, he showed me how to fish for salmon on the troll. He started with the basics and progressed from there. With what he taught me we now usually aren’t too far behind him heading for home after a successful day of fishing. We don’t run a system similar to or just like Bob’s, we run a system EXACTLY like Bob’s. It has been my opinion that Bob is probably the most productive salmon fisherman in our waters, so read on and your scores will improve just as ours did. What I’m going to do is try to open your mind to other ways of doing things. There is no hard-core rule with regards to how to fish. We all have an opinion, and we are all often correct, but with that being said let me also say there is a reason why the same guys day in and day out put the numbers up. When talking about party boats do you think it’s by accident that Jimmy Robertson (Outer Limits) or John Atkinson Jr (New Ray Ann) constantly get the job done, even when others struggle? I won’t be able to teach instincts, this comes from countless hours on the water, knowing the habits of your target, and the fathom line they normally travel in relationship to the calendar, but there are many things that separate the top 5% from the rest of the pack. Things like reading the water (color, rips, birds, etc), telling the difference between krill, squid, and fin bait on your meter, or tracking which way the current running. When the highliners in our community are on the run, hunting for fish, their minds are automatically processing all the data around them, including their meter and other pieces of equipment in the wheelhouse. It’s almost always about bait, but the question is which ball of bait to stop on. I will give you my approach to salmon fishing with downriggers. I will talk about how I run my gear, and why. I will spend most of this article on technique, and touch briefly on those instincts you will need to develop. I can’t help but talk about location and presentation. This is, and always will be, the two most important issues with regards to being successful. It’s really simple when you break it down into these two categories. When I talk about location. I don’t care who you are if they’re not there, your in for a long day. I can also say, it’s imperative that whatever formula or offering you use that it be presented correctly. Things that don’t troll correctly put you at a distinct disadvantage. It does not mean you won’t catch fish, but what it most assuredly will do is prohibit a lot of those epic days that most of us aspire to. I have used and owned all of the major brands, electric and manual. I started with Scotty, and then went to Penn, then Cannon, and back to Penn. After using all these downriggers over the years I have come to this conclusion, everyone out there has a different need in regards to his or her downriggers. One thing to consider with regards to electric is speed of retrieval, and how much weight will they pull, and of course warranty. I’m really not trying to sell product here, but in today’s market if you’re looking for electric. I would suggest that you put Scotty on your short list for evaluation. Some other considerations are if you spend most of your time fishing deep below 80ft, then electric would probably make life easier for you. On the other hand if you fish out of Pillar Point, it’s not necessary to go deep. I spend 99% of my time in the top 30ft of water there and manuals work fine. There is something to be said for manual downriggers. They always work. There is no corrosion in the plug issue or any other electrical problem you might experience with electric. It’s like anything else, if you maintain it you will be fine, but if your one of those guys (like me) that throws them in a corner and walks off the boat, it might result in a problem down the road. One other recommendation I might make about electric is to not buy into all the horns and whistle theory. I fell that more gimmicks means more things to fail. Keep it simple, all you need are up and down and stop. 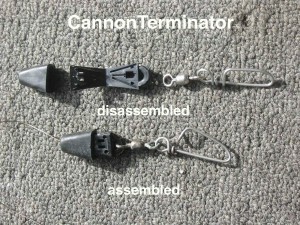 When I first started it was about downrigger cable and sleeves to attach cable to swivel and snaps. Anytime you crimp a cable you create a weak spot that nine out of ten times is where it will break.I highly recommend using the new type of attaching devices that requires no sleeve. I personally like the ones that Cannon has. They have never failed me and if you need to replace your cable, or should you find a bad spot, you can cut the cable and re-use the same attaching device to attach your swivel and snap. This can be done quickly on board, with out looking for more than some wire cutters. Because of all my time on the water, and the demands I put on my equipment. I only get about 1-½ seasons out of my cable, before it starts to come apart. One trick I learned after replacing 300 yards every other year, or sooner per downrigger was because my needs only require fishing in the top 50ft of the water column. I only put on 100ft of cable, and replace it every year with new. I now get 3 years per 300 yards. Your probably thinking, “Bob you should of thought of that years ago”. I have no excuse, but maybe there is someone else out there right now scratching his head going, “Bob you’re not the only dull arrow in the quiver”. I have seen several of my friends replace their cable with spectra over the last few years. This is something new to the game. I have resisted using it because of my philosophy; if it’s not broke don’t fix it. The obvious advantage is a smaller diameter for cable angle and depth, and also longevity. Not to mention no noise going through the water. Some also might say wire pulled through water causes an electrical charge, and depending on your philosophy this helps or hurts. I am not an angler that believes in a black box. There was a time when black boxes were popular. Like anything else, something new come out, we have to have it. 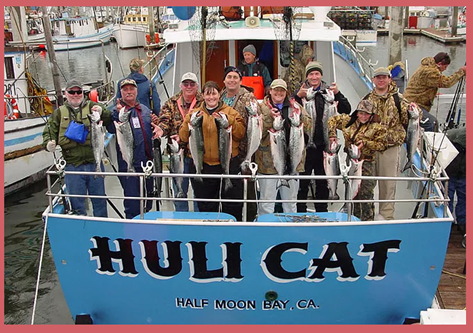 I know lots of commercial salmon trollers out of Pillar Point and at some point in time they were using some form of black box, but over the years their numbers have dwindled and now the prevailing wisdom is they make little or no difference to most of the guys I talk to. My choice for just about all applications in the ocean is a 12lb ball with a fin. If you don’t have a fin even with a swivel your cable will twist up. There are others shapes I have used over the years. We all started with the torpedo shape. That was all that was on the market at one point in time, they worked fine, but we could not find any bigger than 10lbs, and most were 7lbs in the early days-not heavy enough. I find a 10 lb. ball works well and 12 lb is better. There are innovations for trolling with downriggers coming out all the time. One such innovation that came out several years ago was a pie shape weight that on the surface seemed like a logical choice when you thought of less water resistance. This theoretically was supposed to permit better cable angle, which in turn should enable one to go deeper. What we found out is they work great until you pick up a jellyfish or something that slides down to the weight cocking it in one direction or another. They then became a rudder, and like a chicken through the corn, they would take off like a rocket either in or out causing tangles or worse. There was a thread on this on Coastside Fishing Club website recently (www.coastsidefishingclub.com). To be fair there were people that use them, and liked them. I can only give you what my experience has been. I want to tell you a story about fishing deep. I had an angler call me on the VHF radio one day. He wanted to help me, and suggested the fish were at 200ft. I asked him how he knew this, and he said he dropped his downrigger down until it hit bottom at 200ft. I asked him to free spool again and see what happens. He reported another 100ft went out. I asked him to do it again. He said he could not hit bottom because he only had 50ft of cable left. What I am trying to say is there becomes a point where you get further away from the boat but not necessarily deeper. I have been told there is a new product out, that by design it incorporates weight with a downward planning posture to utilize the forward progress of the boat. I have not seen or used this, but it sounds intriguing. The only tried and true way that I know to get deeper is either use more weight, or slow the boat down. Some guys will bump it in and out of gear to slow down enough. This is another one of those things that everyone has a different opinion, and they’re all correct. Some prefer mid ship downrigger placement like me, others like the transom. Wherever you place your downriggers your main consideration should be, “what will be my most productive area?” and “how do I prevent time consuming tangles and other malfunctions?”After years of use, it was obvious to me that my side positions just behind the wheelhouse were by far more productive than the gear on the transom. It was not even close. I was curious about that, so I called several of my friends that run party boats for a living. Legendary skippers like Mr. Bill, and Jimmy Robertson (Outer Limits). Both felt the same as I did, that their side positions were their bread and butter. I run two downriggers on the side just behind the wheelhouse about 10ft from the transom with 12lb balls. 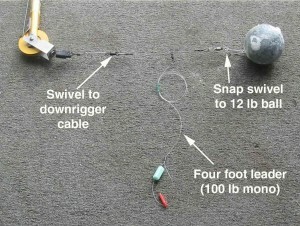 I have three downrigger mounts across the transom, but I normally use only one in the middle with a 6lb ball. The different weight in the center gives me the separation I need and I can honestly say I have never had a cable tangle with this method in all my time on the water. There are some of you saying why would Bob not utilize all down rigger positions if he has enough guys on board. The reason is I don’t have too to get my fish, and less gear means less possible problems. It’s not how much gear you can put in the water, it’s about how you use the gear (presentation). I sense this concept might not play well with some of you, so at the risk of sounding self-absorbed let me suggest this. Look into the Coastside archives at last year’s salmon season (www.coastsidefishingclub.com) with regards to the productivity and time involved on the water. This research might also help you if you’re unfamiliar with the pattern that our salmon have traveled each year for about the last 4 years in a row. Some years some made it further north than others before their biological clock brought them back to the gate and up the river. One of the big advantages of having your downriggers on the side up from the transom is when there is only two of you, it permits you to go into your turn after you are hooked up with no chance of having that fish find the other cable. 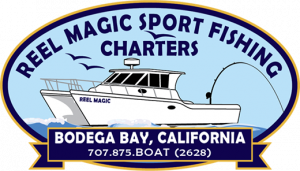 If fishing that center transom spot and that goes off, this permits you to go into your turn, with no cable or lines in the back of the boat, with your other two positions in the game and more than likely going to get bit. If one of the side positions goes off I will turn in that direction, and the transom position will come out of the water if it’s a good fish. With me it’s really about doubles more than anything else. I would say that we get that second fish to go 90% of the time. If it’s a school of small fish, 50% of the time we get a quality fish in our turn. I see more guys put 4 downriggers across the back than any other form of placement. I have good friends that do this, and are really successful. I used to fish like this myself. It was just too much trouble for me keeping fish out of the cable, and I need gear in the water to get that second hook up in the turn. If you are going to put all your gear on the transom, it’s important that your weights are all the same design and weight. This will help avoid problems with tangles if they’re all tracking the same with none further back than others. When you go into a tackle shop it’s easy to be overwhelmed by how many different types of release clips there are on the market. We tend to listen to the clerk for his personal recommendation, because we feel he is in the business so he must know. WRONG.I have a lot to say on this subject. Releases are maybe one of the most important accessory item’s there is when fishing with downriggers. This, like everything else, opinion’s are all over the place, and frankly they all work. If you’re shopping in a store like Hi’s, Outdoor Pro Shop, Fisherman’s Warehouse, etc, you will undoubtedly get good advice. I don’t believe some of the larger chain stores have the personnel to lead you in the right direction. One suggestion I would make would be to look for a clerk that has been there the longest, and ask him not what he likes, but rather what they sell the most of. Let the public help you decide. I have over the years had minor problems with just about every release out there. I demand tightness in my main line. I don’t like bellies in the line once deployed because this does not telegraph everything that is going on at the business end of your line very well, and it leads to premature releases. I have had, for example, the clothespin type releases not hold my main line in place as I sent it down, trying to keep it as tight as I can. I have seen my offering sucked up against the release because of my requirement to maintain a tight line, rather than its normal position several feet behind the cable. I also have a problem with this release when I want to pop it loose myself by jerking up on the rod. It tends to slide in the clip rather than release. There are other types that for other reasons I was not completely happy with as well.Once again you must understand my excessive behavior when it comes to fishing. I repeat THEY ALL WORK, and it’s up to you to decide what works best for you. 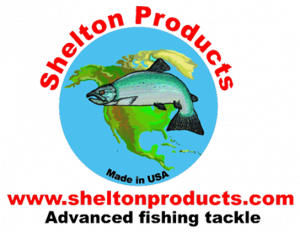 I decided to invent my own release; the plan was to invent something that incorporated my style of fishing into a workable product. I took existing products and added my personal needs. Please look at the picture displayed of the release I use. This will make what I’m about to tell you easier to understand. I don’t like to bring my downrigger balls in to reload my bait. There are several things that happen on occasion when doing this, besides just adding another unnecessary step that takes time. Salmon fishing is like all other fishing, when they want to bite it’s to your advantage to be efficient and keep the gear in the water as much as possible. My feeling is if they want to find a place on my barbeque, I’m not going to get in their way. I have had the weight hit the side of the boat; I have also snapped weights off in rough seas with the boat rocking violently from side to side. With my set up I feel I get the following advantages. (1) The release leader permits you to reach over the side of the boat. With a dedicated crew and a gaff placed strategically in a common area, this permits you to attach the main line inside your boat, and just throw it back overboard without rotating the 4ft boom in. (2) This enables you to leave your weight a few inches under the water. This keeps it from snapping off, or most assuredly hitting the side of the boat if you rotate it in. (3) The customized Scotty release doesn’t permit line from slipping like the clothespin type, either when sending it down or trying to release it manually. (4)If you need to check bait, it permits you to check or replace the bait, or remove a shaker without rotating in. There are many things to consider in this category. 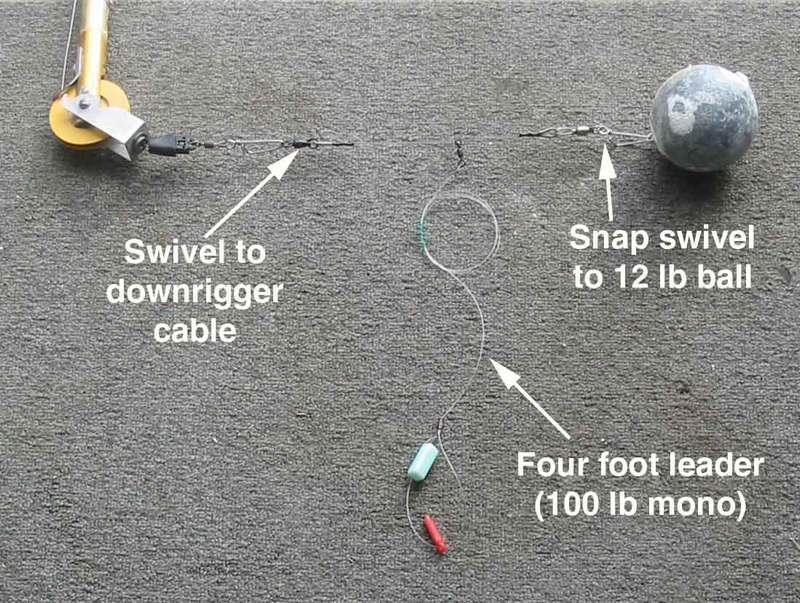 If your goal is to run a single rod per downrigger let me suggest this idea. I run my offering about 10 feet from the cable. 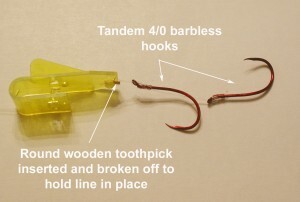 I have gone through all the normal things anglers go through over the years in regards to this.Like you, when I did not get bit I started playing around with how far back to run the bait. After several years you start to realize that the distance from the cable is one of the least of your worries. I will say this, too far back leads to hook set problems due to stretch in the line upon strike, and also permits tangles in turns, especially if you have a lot of gear in the water. Tangles are the curse of all good anglers. If you’re going to stack gear (I’m talking about running more than one rod per downrigger) let me make the following suggestions. I believe my thought process is like many of you. It’s a constant learning curve. We continue to experiment, and discard what fails and improve on what works. I think everyone that starts to stack gear always starts with the thought that they need to cover as much as the water column as possible. We say to ourselves, “I will split the difference. I will run one at 40ft and one at 80ft”, or maybe 50ft and 100ft, you get the idea. A lot of this kind of thinking comes from well-intended tackle manufactures rather than the guy on the water every day. What you will learn by employing that technique is almost all your fish will come from the bottom stop no matter what depth you have the gear down too. Try this. Stack the gear about 12ft apart on the cable. Run the drop back about 10ft back on the bottom stop, and about 15ft back on the top. This will compensate for the cable angle. The objective is to have both baits fishing together only a few feet apart. I would run a metal lure such as a crocodile on the bottom, and bait on top. The purpose of this is twofold, the weight of the metal lure will keep it from tangling the top offering when lowering your gear. 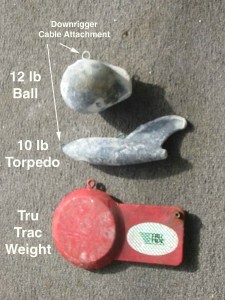 The difference is one has weight the other is almost neutral, the other reason is that you bring the gear up after a missed opportunity, or just to check the bait, it’s only required that you look at the top offering because you know the bottom is always good because it’s an artificial. There is nothing more time consuming and a pain in the neck than having to go through the entire process, because you must get to the bottom offering to make sure you are not trolling scratched bait. You’re now ready to drop your gear down, not to cover a lot of water, but to put both offerings in the strike zone. I think you will see a dramatic improvement in regards to both positions going off, resulting in higher productivity, meaning more multiple hook ups. I bet the entry level guy asks me this more than any other question. What is the best lure? My answer is always the same, what ever you use it must be used correctly (PRESENTATION). Don’t fall prey to the marketing strategy of the wholesaler. Or, just because your friend is having a good day this does not mean he has the lure of the moment.Let me try to explain it this way. I used to do one of the original hotlines from our area. In order to get the best information to the angler, when I was not on the water, I would head for the launch ramp each day to record scores and find locations for the angler fishing the next day. After a couple of years of this it became apparent that every boat is different. I will get into that in a second. The first guy out of the water would say “Bob I killed them today. I tried everything finally I went to herring and that was the key”. The second guy would say something like this, “Bob you should have been out there. It was about hardware. I could not get a bite on bait.” The third guy might say “I used everything in my box; it was a hoochie that turned it around for me.” The fourth guy pulls out an apex, and said, “if you did not have one of these, there would have been no need to even launch”, and on and on. The answer here is most sport boats, unless he has a troll valve or a kicker, only has one speed, that’s the bottom of the throttle. Each lure has its optimum trolling speed where it’s most effective. The key is not to get sucked up into the lure game. Find out what works for your boat at the bottom of your throttle, and everything else will fall into place. One last thought here, most of us are conditioned when we don’t get bit to believe the school went down. Instead of dropping down deeper, try bringing it up a couple times. I can’t tell you how many epic days I have had with my gear down only 15ft. There is not a whole lot that can be said about this. I try and keep my speed constant around 2.6 to 2.8. What you should do is use your GPS and fish finder speed gauge if you have one to judge your speed. They will not read the same. Tidal current and sea conditions will affect one because it employs a paddle wheel. The other has two modes, speed over ground and how fast you’re approaching your target. Become familiar with what they all say and use it as a cross-reference. There are also the visual effects like water going by the boat and cable angle, all of this should be constantly evaluated in your computer. I’m talking about the one on top of your shoulders. As a final test I will watch everything that goes in the water to make sure it’s performing exactly how it should before sending it down. The last thing I will say in regards to this is it’s better to troll a bait slightly too fast than too slow. Because I’m writing this article I will talk briefly about what I troll with and how I modify them to get the presentation I want.There are exceptions to the rule. I’m a bait guy; it’s my dominant weapon day in and day out. I prefer a 5-½ inch anchovies. I think I get better rotation out of an Anchovies rather than a Sardine or Herring. The only time I vary this is in extreme weather. If I happen to be fishing in bad conditions and it is too demanding to expect my crew to work the gear being thrown side to side. In those conditions I will run artificial stuff. It’s just to wet, and uncomfortable to be checking to see if your bait had been scratched every 10 or 15 minutes. Those days are few and far between. I guess we do get a little smarter, as we get older. 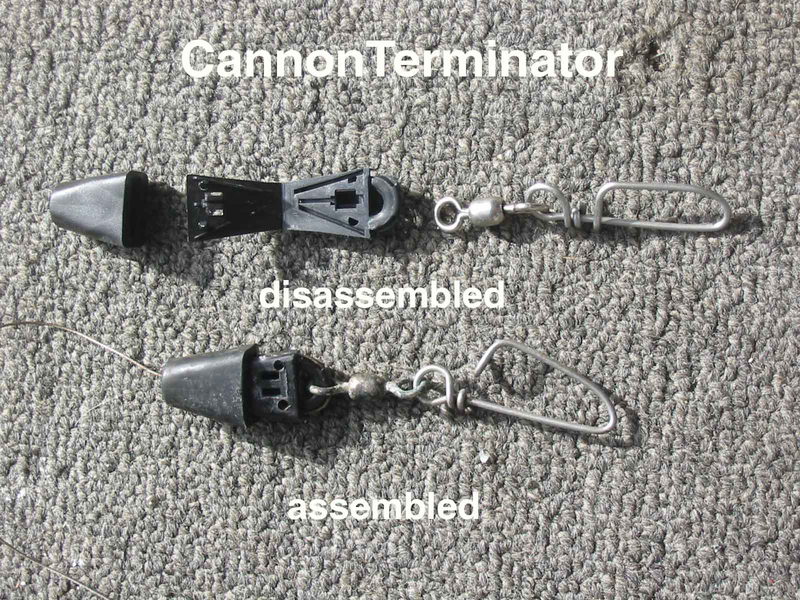 I have nothing against cable baiters, crow bars etc. They are proven salmon killers. 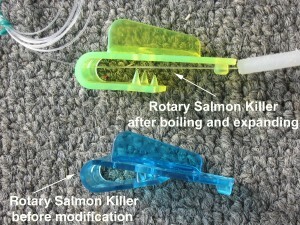 I use a version of a Rotary Salmon killer (RSK) in three different ways. The first employs two hooks, the other two are a single hook. Salmon are notoriously bad fisherman. They miss their target 9 out of 10 times; this creates somewhat of a dilemma. The obvious answer is giving them something with a lot of movement that travels in a straight line, I call this the bullet rotation. 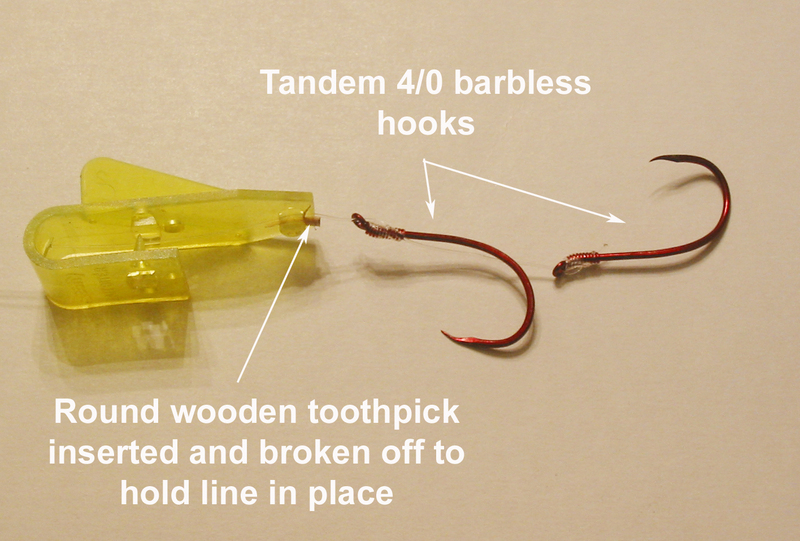 It requires your bait to rotate in a strait line without any flop. In order to get this rotation it sometimes requires extra work on the part of the angler. Just loading bait and throwing it over board gets you what you have earned, success on wide-open days, some success on average days, and no success on slow days. There are things you can do to get “bullet rotation”. To start with, I boil the RSK heads. I bring a very small portion of water to a boil and drop the RSK head in for only a couple seconds, then I remove it and carefully pull the two pieces of plastic apart to create a little separation, then put under cold water. The purpose for separation is to hold the bait, without crushing the head. When the bait head gets crushed it pushes the body out to the side rather than straight back. This causes the bait to flop when rotating rather than spinning on its own axis. I load my bait frozen, this accomplishes two things, it will have memory after thawing, and it’s easy to load. Every once in a while bait won’t rotate correctly. 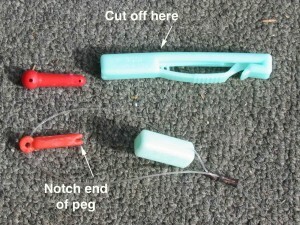 In those cases take it out and invert it, or take the hook out of plastic sheath and rotate it. If that doesn’t work set it free. Some guys are putting a mooching band around the bait and the hook. This does help with the rotation. The other way I fish an RSK is once again, if it’s a new RSK the head must be separated to get rotation. You must eliminate flop. I use 20 or 25lb test. If you use Octopus hooks (this is my choice) you should snell the line. If a siwash or live bait hook is what you like, just tie direct to the eye. Throw away the plastic spacer/hook holder, instead just put the mono through the orifice on the bottom, then up through orifice in head, then tie off to swivel like you would normally do. Take a round wooden tapered toothpick and push into the orifice at the bottom of the RSK and break off the extra. This will put pressure on line to hold hook where you want it. Now you have an adjustable hook placement wherever you like it, eliminating the plastic that is not natural. This method, as I said gives you an adjustable placement, or the opportunity to use two hooks. You should never leave the ramp or your slip without a game plan. To say I will hear something on the radio, or stumble into them is pure folly. The biggest tool the young angler has today that most of us did not have in the early days is the Internet. 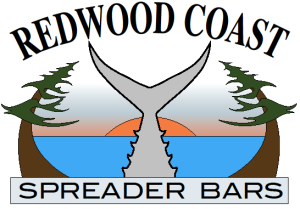 There are several informative fishing sites like the Coastside Fishing Club (www.coastsidefishingclub.com) out there with the best information available. My fish are caught for the most part before I leave the dock. In the past it was important to network, be part of a group that was on the water everyday. To have friends in the Party Boat and commercial industry, to know a warden or two that could provide you with knowledge. This was not easy for most anglers, especially if they lived away from the coast. Today, all this information is only a click away on the Internet. As far as the latest updated information by the print media, it would have to be Western Outdoor news. When traveling, look for the obvious things that would tip you off to salmon being present. Things like dark, or chocolate water. Look for rips where two opposing currents come together, this is characterized by foam or debris in the water. Locations of birds, whether they’re feeding or not should always get your attention. Finding bait is always the most important, and its importance will escalate as the other signs materialize around you. Keep in mind salmon are creatures of habit. The last few years, for example, out of Pillar Point we started off at Pigeon Point, and followed the salmon on the outside beyond the 50-fathom line north each day until they hit the Gulf of the Farallons later in the season. We hope in my region that they don’t go above Point Reyes because sometimes they don’t come back until its time to run up the gate. We also hope that they stagger back in their return to give a sustainable bite of big fish for the north side rather than all coming at once for a crazy few days, and then it’s over. It’s also important to know the history of salmon. For example, the fish that did not follow the 50 fathom line in the past out of Pillar Point would get up on the shelf and move into places like Martin’s Beach, Pillar Point Buoys, Egg Rock, Pedro Point, Pacifica Pier, Mussel Rock in the late spring and summer. So I guess what I’m trying to tell you is that instincts are a combination of knowing the past history, the present history, and the conditions around you. If an angler swings by Martins Beach on his way in from a slow day for all and just hammers the fish because he heard Bob Engles (party boat Queen of Hearts) say on his way to fish rockfish in the morning down south, that there was dark water, and bait 8 miles south. The highliner filed that little piece of knowledge away for the moment in case he could not find fish on the outside. He will keep that as a hole card as a last resort. He knew that Bob must fish inside 20 fathoms (regulations). He also knew that 8 miles put him in maybe 100ft of water off Martins. He knew the history; it was the right time of year for them to be there. So he ran 8 miles out of his way on the way in and stacked them. When the news of fish at Martins breaks, there will be some that said he was lucky, there will be some that ask what was the magic lure? There will even be some that doubt the story. I suggest it’s a combination of things that had nothing to do with luck or a lure. One last thing before I start to button this up, is with regards to patterns and sign’s. When you think you have it all figured out they will throw you a curve. The fish gods hate people that brag or take success for granted. It’s like the young angler that limited out in 10 minutes one day, and promises his new crew the next day that they will be done in short order. It seems as if that is the kiss of death! I want to conclude this article, and all future articles with this thought. The point I would like to make is harvest versus responsibility. I wrote this article to try and give the young angler something to think about, to open his mind to other approaches. The purpose is to make him a better angler. With success comes responsibility, just because we can, does not mean we must. So remember only take what you can use. 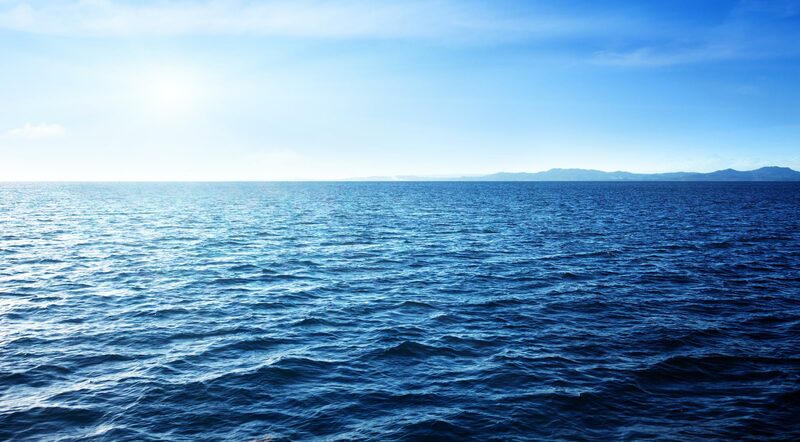 The days where people thought the ocean was an endless resource are gone.